As an Adventurer you can explore the pyramid, searching for archaeological relics hidden or buried in four chambers or corridors. But perils haunt your pursuit of treasure, and falling stones threaten to trap you inside forever if they obstruct the only way out. Adventurers must also be wary of hidden threats that can wound them and living mummies who roam the corridors! The second offering of The Adventurers (The Pyramid of Horus) is my first foray into the series. This review is written for players new to the franchise, as opposed to a comparison with the first game. You’re an adventurer, looking to grab treasure from Horus’ tomb. The player who successfully leaves the tomb with the most victory points is the winner. Be careful, the more treasure you carry the more encumbered you’ll become, which may give fewer actions each turn. How far will you push your luck? Will you make it out before becoming sealed in the tomb forever? Picking up the general gameplay will be rather straightforward for both gamers and non-gamers, making this an option as a gateway game. 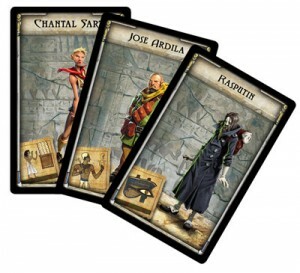 The main part of your turn will be to use action points, either to move around the board, or grab cards. Carrying more cards, whether treasure (VPs), equipment (helpful), or wounds (decidedly unhelpful), may slow you down and limit the number of actions you get each turn. The determination of how many actions a player will get each turn is the toughest part of the game for new players to grasp, but makes sense after a few turns. Five dice will be rolled, and you’ll get an action for each die rolled above a certain value. This value is based on how many cards you’re carrying. At the end of each turn, a block will fall from the ceiling, covering a tile (and possibly wounding your character). Once a block falls on a spot, that space is now impassible. Each character has a one-time-use special power, but otherwise play identically. There are four sections to the gameboard where you can grab treasure. This is typically done by drawing a card. Depending on the area, there may be treasure (VPs), equipment, or an animal waiting to give you a wound. Not all treasure in a given section is worth the same amount, with sections deeper into the board having a higher potential payout. There are also mummy figures walking in front of sarcophagi. Each sarcophagi has a card face down requiring an action to look at, and another to grab. Each set of five will have one each of a one, two, three, four, and five. There are also five icons, worth larger points. You will need to roll a specific sequence to pry them out, with re-rolls allowed for extra actions. Each icon you grab is cursed, and for the rest of the game a die of a certain color will no longer give you action points. Components of a game are not a major factor for me, but I appreciate they can be a big selling point for attracting new gamers. The Adventurers will do well in getting someone’s attention. The board is large, though not overly colorful. The figures are well sculpted, though a flat gray color. The blocks that fall from the ceiling each round are large and make an impressive pile next to the board. It’s not as eye popping at Ticket to Ride, but I think it would grab attention from across the room at as well or better than Settlers, Carcassonne, or Alhambra. The Adventurers has a push your luck element to it, that when coupled with rather straightforward rules, makes it fun for a casual evening of gaming. New gamers will pick it up quickly, and there are enough choices to keep people entertained. It is not a deep strategic game, and the random card draw can really benefit one player over another. If I were giving a recommendation to the type of group that may like this game, I’d look for people who really enjoy adventure games with treasure hunting. You get the feel you’re digging for treasure, and trying to beat your opponents to the best items (even if you don’t know where they are). The ‘timing’ mechanism in the game (the ceiling falling) is a nice touch, as it can allow a player to be trapped, increasing the tension. Overall, The Adventurers is for casual groups. The push your luck element is not as good as Incan Gold, but the exploring theme is better. Risking the mummies for better cards, or trying your luck at prying out an icon is fun, and gives a sense of accomplishment when successful. When a player is trapped, it will usually be very near the end of the game so as to keep a player from sitting out long (though I would say the playtime is a little long for someone to not escape, and still enjoy the experience). I’d give The Adventurers a “try before you buy” rating. Groups that enjoy casual play instead of intense strategy games may really enjoy giving it a home. More avid Euro-gamers may enjoy a play or two, but will likely move on quickly to something else. 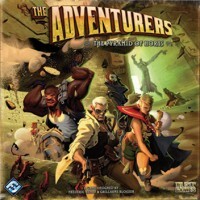 Add a Review for "The Adventurers: The Pyramid of Horus"